Hope is a 2 to 3 year old spayed female who is heart worm negative, current on all vaccinations and is microchipped. She is very shy but will stand for pets and body rubs but will quickly retreat once you stop petting her. 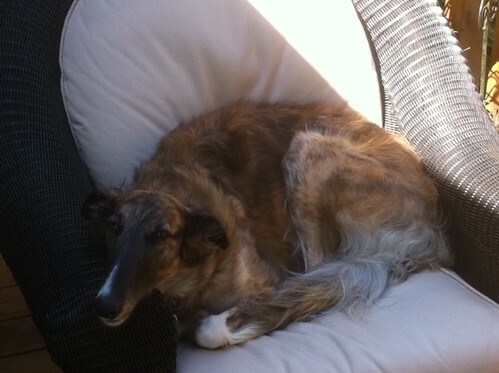 She gets along well with other sighthounds but has not been tested around cats or small dogs. We believe Hope will bloom with some personal attention and become quite the wonderful borzoi companion. Hope does have a Grade 2 heart murmur that was found during her spay procedure and she had some trouble with the anesthesia. The vet recommended that if she were ever to be anesthetized again, to use gas only and NOT use intravenous Xylazine. Hope is from Pickle Hill.